Be the first to share your favorite memory, photo or story of Boke. This memorial page is dedicated for family, friends and future generations to celebrate the life of their loved one. Boke Gill Kim, age 93, passed away on Sunday, December 2, 2018, at Turkey Creek Medical Center with her family by her side. 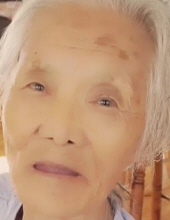 She was born in North Korea and moved to South Korea just before the Korean War. Boke raised four children with her husband in South Korea until moving to England in 1980 to live with her daughter. She would follow her family to Knoxville, Tennessee in 1984 where she lived out her life. Boke is survived by her daughter, Grace Gault, owner of Fruition Café in Farragut. She was a loving grandmother that helped raise Grace’s two children, Gene and Sonya. Her other surviving children are Chang Kim and wife, Gibi , and Myong Sebek, and their children, Mia and Jay Kim and George and Jonathan Sebek; and four great-grandchildren, Caleb Mahaffey, Jacob Hale, Jasmine Sebek, and Sofia Sebek. The family will celebrate her loving, selfless, and inspirational life in a private Korean ceremony at her home. To send flowers or a remembrance gift to the family of Boke Gill Kim, please visit our Tribute Store. "Email Address" would like to share the life celebration of Boke Gill Kim. Click on the "link" to go to share a favorite memory or leave a condolence message for the family.